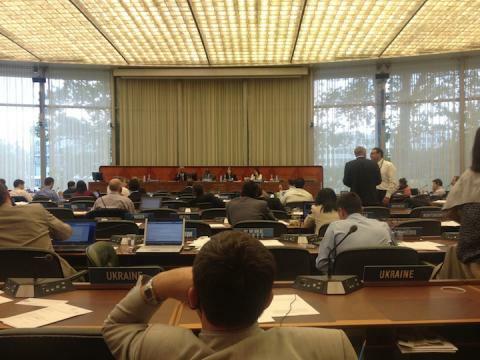 From July 16 to July 25, 2012, roughly 185 states are meeting in Geneva at the World Intellectual Property Organization (WIPO) to discuss three international treaties on copyright exceptions and limitations, as well as to negotiate alleged content rights of broadcasting organizations. Specifically, it is the meeting of the Standing Committee on Copyright and Related Rights (SCCR), a subcommittee of WIPO that leads discussions on the means to protect copyright. Since 2004, WIPO’s SCCR mandate is the discussions of the establishment of standards for exceptions and limitations in copyright, as part of its implementation of the Development Agenda— a topic that EFF has covered extensively. This discussion on exceptions and limitations began with a proposal from the Chilean Ministry of Education, and was eventually incorporated into SCCR’s main agenda but was split into three access areas: education, the visually impaired, and libraries and archives. Chile asked WIPO to include the subject of exceptions and limitations to copyright and related rights for the purposes of education, libraries and archives, and disabled persons on the agenda of the Committee and "to strengthen international understanding of the need to have adequate limitations, learning from existing models and moving towards agreement on exceptions and limitations for public interest purposes, which, like minimum standards, were to be envisaged in all legislation for the benefit of the international community". The member countries widely accepted the agenda, and in 2008, WIPO submitted a series of studies on exceptions and limitations for the visually impaired, libraries and archives. In the same session, WIPO commissioned a study on exceptions for educational purposes, including distance education. In 2010, the African Group brought up for discussion a treaty for the visually impaired, education and research libraries and archives in a single text. The latest version was discussed at the end of 2011 and it seems that this is the document that is now waging negotiations. As these copyright treaty initiatives grew in momentum through several rounds of negotiations however, some rifts in support began to emerge. It is great that the U.S. delegate thinks that and makes such an affirmation at WIPO, however, the claim that the U.S. copyright fair use system provides “full participation” is actually not true. For instance, U.S. laws upholding digital locks (AKA digital rights management [DRM]) have always prevented educators from lawfully accessing content. Even under U.S. law, where educational purposes can in certain circumstances count as fair use, the tools to break digital locks themselves are banned from distribution. Moreover, we have seen how educational institutions in the U.S., out of fear, would enact restrictive policies on content access, in order to avoid the threat of a copyright lawsuit. A state university was sued by an academic publisher for failing to pay blanket license fees—the legal requirement of which is itself dubious—and faced 75 counts of infringement. In order to protect themselves from further liability, they preemptively enacted new content restrictions, even though the judge ultimately held that only 5 of those cases were actually infringing on copyright. Undoubtedly, this case is one of the many countless instances where copyright has proven to be a chilling effect on access to information and learning. For other nations involved in the WIPO negotiations that do not even have positive case laws or any fair use policies, the impact on educational access to digital content could be much more dire. Thus EFF, during its participation at the SCCR meeting last week in Geneva, has urged state Members to move forward with a treaty on exceptions and limitations that are appropriate to the needs of teachers, students, and self-learners in the digital age. For that, we have put together a joint statement with more than 18 organizations from around the world. EFF, Knowledge Ecology International, Public Knowledge, and along with other civil society groups, librarians and universities around the world, are now fighting for digital access rights for education that will address the technological realities of the current and coming generations. "(...) Education should be accessible for all without barriers of space, time, or cost. Digital technologies, from the portable computer to mobile phones to tablets, are being introduced as crucial educational tools in countries ranging from South Korea to Nigeria, from Brazil to the USA. Educational materials and, therefore, its market, is increasingly becoming digital and policymakers must consider this trend when drafting copyright exceptions and limitations in a way that is appropriate for future generations and the digital age. The increasing adoption of Information and Communication Technologies (ICTs) in the classroom and in libraries and archives has proven that teachers, learners, researchers, librarians and archivists need rights to access, use, remix, text-mine, exchange, and collaborate on educational materials. Similar rights must be ensured beyond the classroom and library or archive, taking into account the growing importance of e-learning, online communication, and the increasing practice of exchanging educational and other information content across geographical and institutional borders. The international copyright system has recognized the need for exceptions and limitations from its earliest days. Without these, the copyright system would not be able to achieve its fundamental purpose of encouraging creation and innovation for the benefit of all humankind. (...)"
From the earliest days of the Berne Convention, the international copyright system has recognized exceptions and limitations to copyright. All copyright systems across the world, to varying degrees, are focused on promoting the creation and dissemination of knowledge. Exceptions and limitations are an important part of an efficiently functioning copyright system. They allow creators to access and build upon the knowledge generated by others. Without exceptions and limitations, the copyright system would not be able to achieve its fundamental purpose of spurring creation and innovation for the benefit of all humankind. Exceptions and limitations also serve a second critical function: they allow countries to create tailored access regimes, to meet national needs and public priorities, such as exceptions for distance education to foster learning, capacity building, and development. 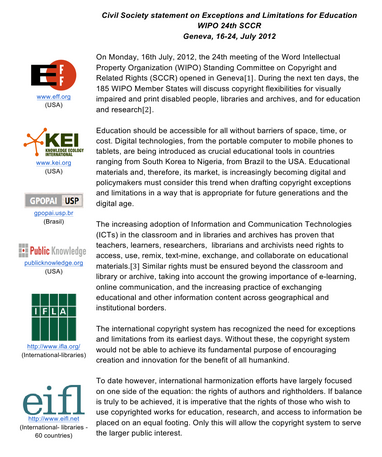 A new multilateral means of creating mandatory minimum exceptions and limitations to international copyright law is required to foster education, libraries and archives and facilitate uses by disabled persons, and to re-balance the international copyright regime to serve the needs of all the world’s citizens. Previous EFF Deeplinks on this topic. Go here to access and distribute the joint statement from civil society, universities, and libraries. All WIPO documents are available here. Check out KEI’s video channel with interviews on participants and delegates at the WIPO SCCR 24th meeting on Exceptions & Limitations on Copyright for Education, the Blind, and Libraries and Archives.